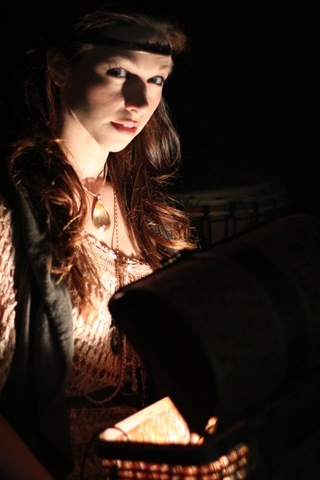 Quest Theatre Ensemble has created a community experience in the truest sense of the word with Drum Circle Pandora. This is actually theatre of the people where in the audience is encouraged to participate in a celebratory manner. Many theatres try too hard to draw the audience into an alternative reality for a short time. 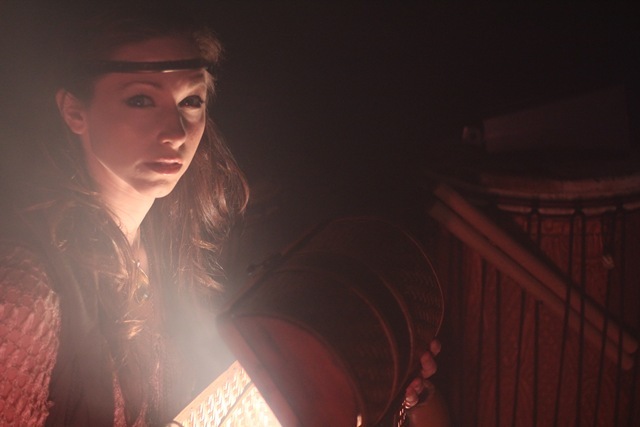 Quest, however, provides a dizzying array of percussion instruments for the audience to use, allowing participants to create the production on a primal level. The first act is the drum circle part of the evening. Drum circles invite people to release emotion and raise inner consciousness through communal drumming and singing. Quest expertly uses this vehicle, then, to create an open and receptive audience-experience. The audience is first given a lesson in achieving different sounds from the drums by cast member Aimee Bass, aka ‘Sister Drum’. Bass is accompanied by Kim DeVore, aka ‘Sister Didge’. Bass and DeVore are exceptional musicians; their charismatic presence adds color and intensity to the music emanating from their chosen instruments. Act two, which adds an electric ensemble to the first act performers, is centered on the myth of Pandora – but with a twist: Pandora was not responsible for all of the evils of the world. 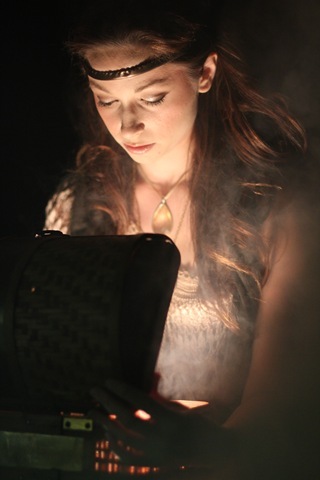 Instead, by opening the box, Pandora illuminated what was already there. This makes it possible for humankind to see that the perception of evil comes from within as does all good and hope. Creator Andrew Park provides a Greek Chorus of Brother Sun and the Sunshine Girls to accompany Pandora’s journey. Jason Bowen plays the role of Brother Sun with great humor and a touch of lusty naughtiness. In the tradition of musicals such as Hair and O Calcutta, songs are anthems to moral restraints breaking free. But Pandora instead explores the responsibility that springs from that freedom. The quandaries are still the same in every era. How does humanity ignore what we have wrought? There is poverty, war, and environmental ravages, but people choose not to put light on the situation. While the entire cast does a wonderful job of dancing and singing, Angelica Keenan does a star turn in the title role. Her skills as a dancer are excellent. One unfortunate exception, however, is a dance she performs while wearing boots, a clunky costume choice that literally hampers the beauty of her movement and the gravity of the scene. Ms. Keenan is paired with Merrill Matheson as her spouse Epemethious. Matheson is excellent in portraying societal denial with the personas of businessman, husband etc. A wonderful ensemble featuring music in arena rock style enhances the song productions, harkening back to the Rick Wakeman days of the group Yes or Emerson, Lake & Palmer in their heyday. The addition of a didgeridoo by Ms. DeVore adds a sinister and primordial shading to Act 2. The music underscores the archetypal essence of the Pandora myth, i.e., women are usually to blame for the downfall of man in patriarchal tales. 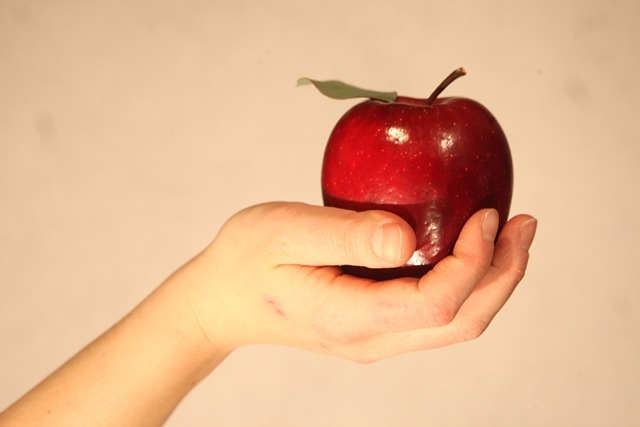 There was Eve and her apple, before her Lillith and concurrently Pandora. Drum Circle Pandora seeks to put an equal spin on how it all went down and how everyone must look at what we create in full light as the ultimate solution for harmony, prosperity, and good stewardship of the environment. In the process, Quest creates a timely tale, especially considering the state of the world at the moment. A special mention must be given to the production’s set design and scenic artistry. Nick Rupard and Julie Taylor have done a fabulous job of alternating cyc walls and moveable scenery. Whether it is sunflowers or destruction, the sets are lush, giving added depth to the action. The masks and puppetry by Megan Hovany are exceptional as well. Drum Circle Pandora is a rich and crazy carnival for the eyes and ears. You will be singing the theme song ‘Come To The Circle’ long after you leave the theatre. The mission of Quest Theatre Ensemble is to provide free access to theatre for everyone. The productions are free of charge but donations are welcome – and will certainly help the company buy more instruments and to help spread the word about the production. Drum Circle Pandora is best for ages 12 and up, as some scenes are quite intense. Also, other than the drumming, I’m not sure if kids younger than 12 will understand the premise (though I’m speaking from a mother’s perspective). 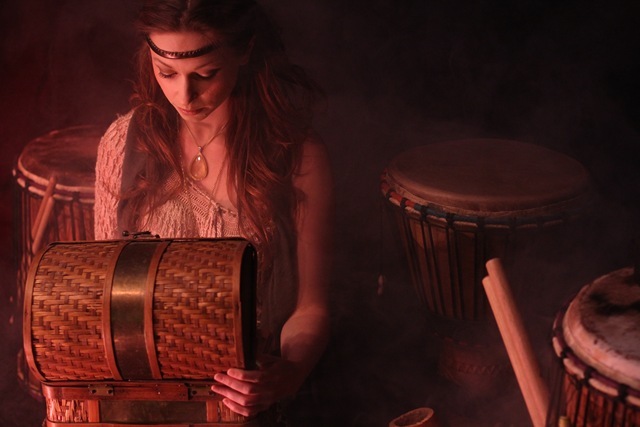 Drum Circle Pandora runs every Friday and Saturday at 8:00pm and Sundays at 2:00pm. Admission is free but reservations are encouraged and honored. The theatre is located at Quest’s Blue Theatre – 1609 W. Gregory. It is in the St. Gregory the Great School building that is accessible by CTA. Go and get your drum on as the summer wanes! Science/Religion. Explosion/Organic. Inevitable/Mystical. 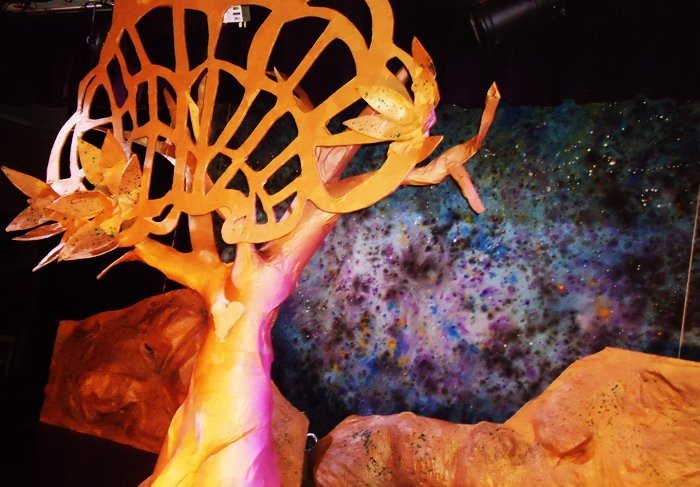 Quest Theatre presents Evolution/Creation, a theatrical experience for the senses. Upon arrival at the Quest Blue Theatre, each audience member receives a red or green wristband. The red tags enter the doorway marked “Evolution.” The green tags go to door #2, “Creation.” The theatre has been split into two sides with a nine member orchestra straddling the center dividing line. Two different plays perform simultaneously with shared music. After the intermission, the audience goes through the opposite assigned door to experience the flip side. With no spoken dialogue, Evolution/Creation is all about innovative imagery set to music. The show starts with dramatic Latin chorale singing from scientists and monk types on each stage. They are separated by the band. As the actors stand from the kneeling position, the orchestra sits. Curtains rise on either side. The band and the other stage are no longer visible. In the beginning, there was…. First up, Creation! It’s the Genesis story plus the Noah tale to tell the origins of how the world began and began again. The cast is dressed in black with oversized paper mache heads. The strong religious overtones are represented with the Creator’s huge hands. Each day’s goal is announced with parchment type scrolls. Each day’s success is demonstrated with puppetry and nature. It’s a wholesome pageantry of seasons, stars, horses and other organic elements integrated in a sequential order of occurrence. Adam and Eve arrive on the scene, eat an apple and Eden is destroyed. The destruction continues with a flood survived by Noah and his animal selection. When the rain stops, creation the sequel happens again. 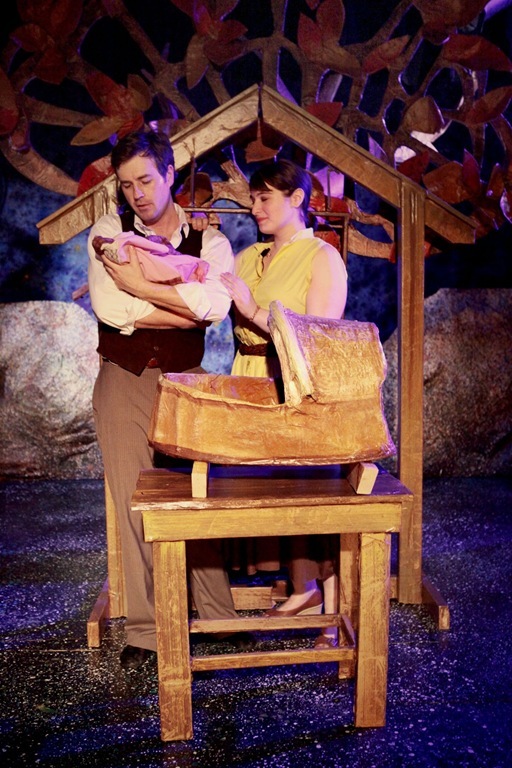 The Creation play has a slow pacing innocence with familiar simplicity. Later, Evolution! It’s the big bang version of how life started from nothing. Initially, a dancer clad in red pieces together ribbons to spell out “Love” and then continues until it spells “Evolve.” The cast is dressed in black with matching hoods. Darkness is a strong theme for the unknown. Rain, smoke, strobe/black lights are the multiple techniques used to illustrate different advancements in life forms: lights to amoebas to dinosaurs. The narration of evolution is a projection of the process’ description over billions of years. 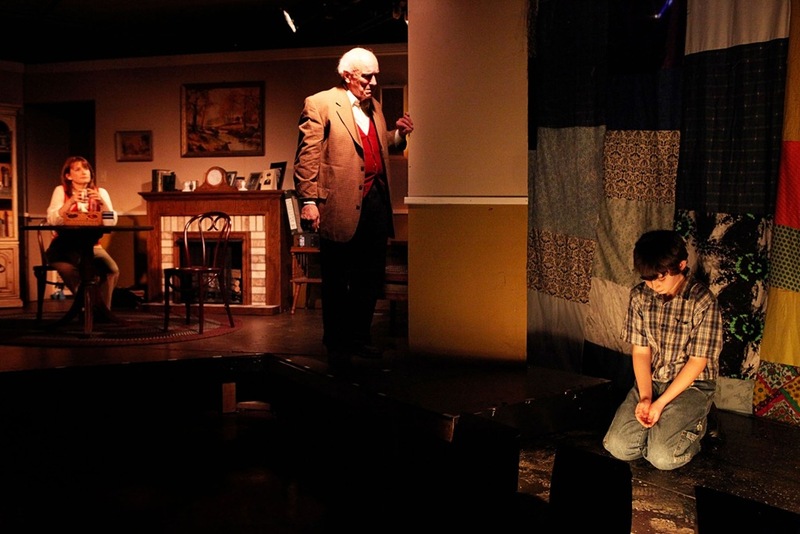 Evolution is the edgier play representing a stark happenstance explanation of the world. Both shows are the ultimate visual of the juxtaposition in these competing theories: science vs religion. One of the best moments occurs when Evolution briefly shows an overlap between theories on the monkey to human spectrum. 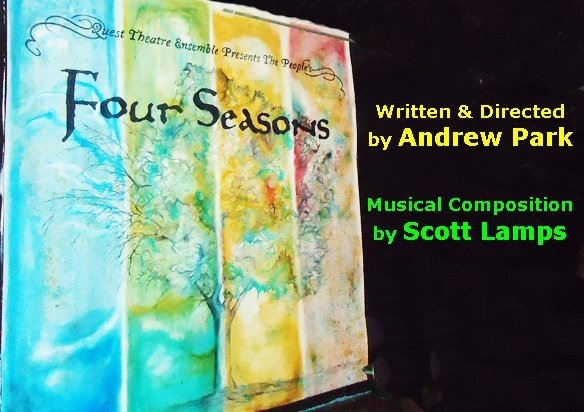 Written and directed by Andrew Park, this is a fascinatingly unusual theatrical experience. It’s the coordination of two plays, eighteen cast members, and a nine piece orchestra, composed by Scott Lamps and directed by Gary Powell. It’s a show that could easily be viewed multiple times to determine all the nuisances. I’m still puzzling over the music score. Practically speaking, it seems like it has to be the same for both shows. But the plays are so different, the music must be too. I continue to be intrigued…. In their mission to “Inform, Delight, Inspire and Unite” the community, Quest Theatre experiences are free/donation. The audience is an eclectic combination of young/old. Families have an affordable opportunity/privilege. Unfortunately, it wasn’t cell phones that disrupted the performances’ flow on Saturday night. It was the constant chatter of two (8-10 year old) girls. NOTE to parents: If your children haven’t evolved into respectful audience members, you need to stick to children’s theatre or create a stay-at-home family night.